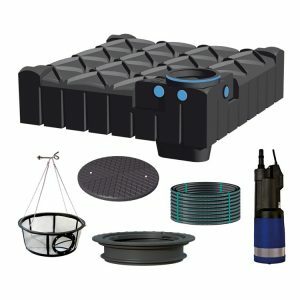 The Standard Rainwater harvesting system for garden use focuses on the F-line shallow dig tank. 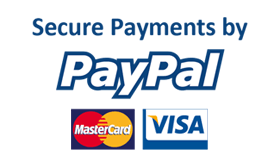 Offering easy installation and reduced installation costs. The system can be upgraded to allow for deeper inlets and drive on cover. Please view the individual systems below for more in depth description and system drawings. 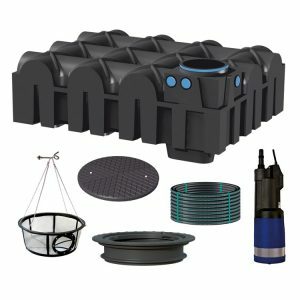 The 1500L Standard Garden Rainwater Harvesting system offers high quality components and the flexibility to design the system to suit your own garden. The Flat tank has a 25 year warranty, its shallow design makes DIY installation easy! The Submersible pump allows you to deliver water up to 50 metres away. Use the harvested rainwater to water plants or wash the car! The 3000L Standard Garden Rainwater Harvesting system offers high quality components and the flexibility to design the system to suit your own garden. The Flat tank has a 25 year warranty, its shallow design makes DIY installation easy! The Submersible pump allows you to deliver water up to 50 metres away. Use the harvested rainwater to water plants or wash the car! 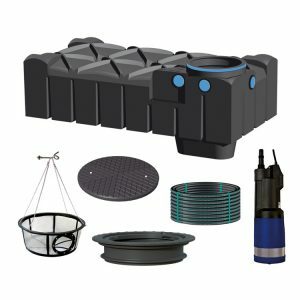 The 5000L Standard Garden Rainwater Harvesting system offers high quality components and the flexibility to design the system to suit your own garden. The Flat tank has a 25 year warranty, its shallow design makes DIY installation easy! The Submersible pump allows you to deliver water up to 50 metres away. Use the harvested rainwater to water plants or wash the car! The 7500L Standard Garden Rainwater Harvesting system offers high quality components and the flexibility to design the system to suit your own garden. The Flat tank has a 25 year warranty, its shallow design makes DIY installation easy! The Submersible pump allows you to deliver water up to 50 metres away. Use the harvested rainwater to water plants or wash the car!